Ooo Baby Knits: What Did You Get for Valentine’s Day? My husband gave me a stomach bug. I also got my favorite candy which I can’t eat yet. Next year I’m holding out for flowers. But… Bed time = knitting time! I finished the back of my pink Debbie Bliss and a Jaywalker sock. The edges of the sweater are bound to roll no matter how well I block, and I don’t like rolly edges. I do like the simple lines of the sweater, so I have to decide before I start the sleeves- to seed stitch or not to seed stitch? I can always pick up the bottom edges of the front and back to add a border. I’m thinking about adding short rows at the front neck to make it scoop a little. I don’t like anything touching my neck. It’s just a thing I have. Why do I love a pattern then insist on making as many changes as I can? The Jaywalker I love. The pattern and yarn were meant to be together. I finished the mitts and a hat for DD#1’s birthday. The mitts are this basic pattern with a longer cuff and hand, and a cable added. The hat is my basic hat pattern, both in TLC Amore. The cake is (was) red velvet and very good. The icing is (was) weird. I would show you a picture of my grown up baby, but all people pictures are on DD #2’s camera. I’ll add one later. We had spring weather until after Christmas. Daffodils were beginning to bloom. Parsley was sprouting. The coreopsis and dianthsis had a few blossoms. Now they are all frozen and so am I. We’re expecting a heat wave this weekend with temperatures reaching the 40s. I can’t wait. I’ll only have to wear one pair of socks. That’ll give me a chance to darn holes in my woolies and get my hats knit for the homeless shelter before the temps drop again. I’m also working on a baby sweater. Can’t knit enough baby things. Your daughter did a great job on the purse. 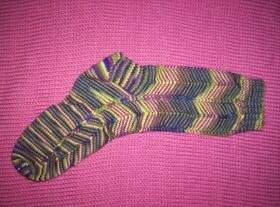 Jaywalker is so pretty in that yarn. I have to ask...what was weird about the icing? And now I want to know about the icing too. I want to know how I get on your daughter's gift list. . . I love the Jaywalkers. I have some hand dyed yarn from Autumn House Farms in the same colors. I may just have to hunt up my pattern. Hope you feel better soon. I am so jealous! I can't get my daughter to knit! Yours did a great job!